Save up to 70% during the Super Summer Clearance at Gymboree! Now's the time to start racking up on the savings when shopping for kids clothes! End of Season sales are always my favorite due to the amazing deals you can run across on items that stores may see as "Out of Season." Just because a retailer labels a selection of clothing as Summer Clearance, doesn't mean that you can't style up those "Summer Clothes" and to create perfect Back to School, Fall Season outfits! While there are many tank tops selections throughout the Clearance Event, I was also able to find many selections that wouldn't take much to be Fall ready. Take their Ruffle Sleeve Pocket Tees (On sale for just $5.99 each) and pair them with some roll-up Cargo pants or even a pair of cute jeans (Some selections of jeans are available in the Super Summer Clearance section but any pair of jeans will look great.) You can also add one of the hoodie jackets that are also on sale to complete the look! If you happen to fall in love with an adorable dress that don't have enough sleeves to be worn alone during the fall, like the Colorblocked Maxi Dress, try adding an Easy Cardigan from the Special Deal section. You can also add a pair of leggings as well to warm up the look a tad more if you like! 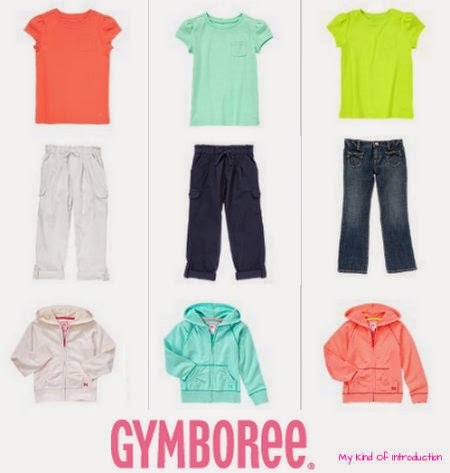 Don't forget to sign up for Gymboree Emails and receive 20% off your next purchase as well as FREE SHIPPING on orders $50 or more! You can save even more when you redeem your Gymbucks today!